Immunofluorescence of TGe staining in Cryosection of Human skin of dermatitis herpetiformis patient. 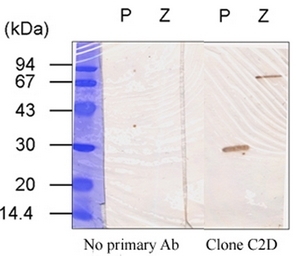 The section was incubated with AP02094SU (1/100) followed by incubation with Cy3-labeled Goat ant-Rabbit antibody. 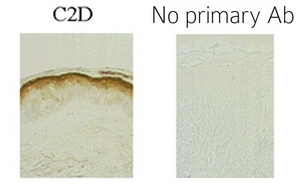 This antibody stains the epidermis and aggregates within the dermal papillae (Red). TGe colocalizes with IgA (Green) in these precipitates. Sardy M et al. (2002) J Exp Med 195(6): 747-757. 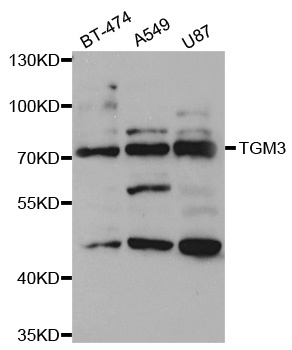 Lane 1: Loaded with proteolyzed form (47kDa and 30kDa). Lane 2: Loaded with the zymogen form (77kDa). 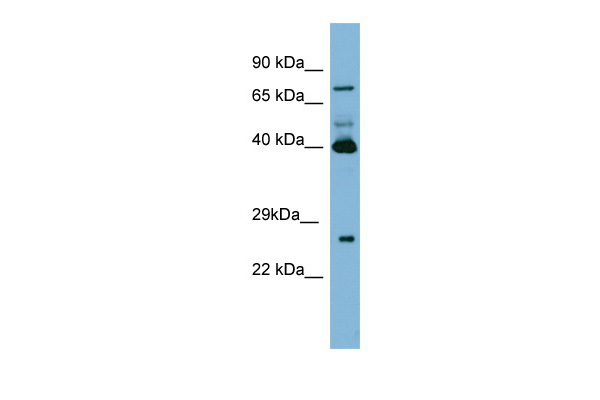 Western Blot using Transglutaminase-3 antibody Cat.-No AM10225PU-N :P: Loaded with proteolyzed form (47kDa and 30kDa).Z: Loaded with the zymogen form (77kDa). 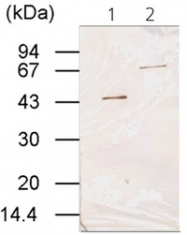 TA309514 (0.3µg/ml) staining of Human Tonsil lysate (35µg protein in RIPA buffer). Primary incubation was 1 hour. Detected by chemiluminescence. Western blot analysis of extracts of various cell lines, using TGM3 antibody.